Former children and Jestfest favourites Foil Arms & Hog return with their brand new show “Doomdah”. You’ll learn how to speak Dublish, find your perfect stereo from a broad range of stereotypes, and thank God you’re not the tallest person in the room. Foil Arms and Hog are Ireland’s top comedy sketch group. Called ‘Pure Brilliant’ by Tommy Tiernan, they have over four million hits on YouTube and have sold out five shows at Dublin’s Vicar Street. 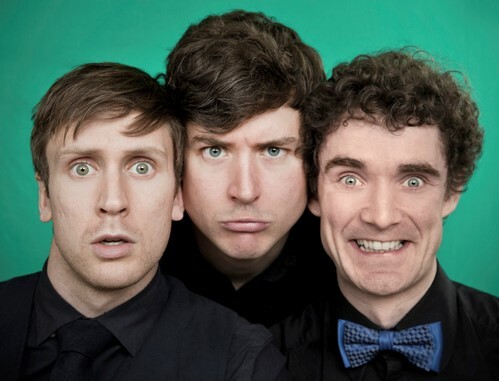 With regular sketches on RTE, viral comedy hits like ‘How to Speak Dublin’ and over 400,000 online followers, Foil Arms and Hog have established themselves amongst the new breed of Irish comedy stars.A blend of bizarre, surreal and hilarious sketches, this is a show not to be missed. Strictly over-18's. Fully seated show in the O'Reilly Theatre.